The folks at Disney specialize in romanticized treatments of remarkable sports stories: Miracle, Glory Road, The Rookie, and Invincible (which, admittedly, also had its good moments). Firmly in that pedestrian tradition, Secretariat tells the tale of the titular Thoroughbred and its legendary 1973 run at horse racing’s Triple Crown, but channels sports history through the considerably less interesting life-story of Penny Chenery (Diane Lane), its housewife-turned-racehorse owner. Chenery inherits the family breeding farm in Virginia from her ailing father (Scott Glenn) and, through guile, luck, and inevitable sass, raids horse racing’s all-boy’s club. Her obsession nearly bankrupts and tears her family apart, but even an intra-family red state-hippie state divide is no match for Big Red’s unifying power. Secretariat an unabashed, shameless crowd-pleaser – beating up on it feels akin to sending the mighty horse to the glue factory. 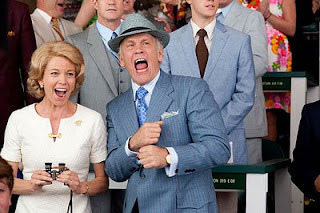 Director Randall Wallace (“We Were Soldiers”) has a firm grip on his subject’s formidable reins – his rendering of Secretariat’s astounding 31-length win at the Belmont Stakes is sublime until he slaps on an overblown gospel choir accompaniment (the Edwin Hawkins singers 1969 version of “Oh Happy Day”) down the home stretch. There is the de rigueur eccentric cast of characters, including John Malkovich playing, well, John Malkovich, this time under the guise of Hall of Fame trainer Lucien Laurin. And, although the film cuts many factual corners, it deserves credit for reserving screen time for Eddie Sweat (Nelsan Ellis), Secretariat’s loyal African-American groom. The problem – beyond its saccharine presentation – is that screenwriter Mike Rich, loosely adapting William Nack’s book Secretariat: The Making of a Champion, focuses the screenplay so sharply through Penny’s prism that it never fully appreciates or depicts the Secretariat phenomenon and its place in the American ethos, coming post-tumultuous 1960s, near the latter stages of the Vietnam War, and one year before Watergate (unlike, by comparison, the decidedly Depression-era set Seabiscuit). Rich spends more screen time on Lucien’s funny pants, daughter Sarah Tweedy’s one-dimensional dalliance with the peace movement, and revolving press conferences in which Penny and Pancho Martin (Nestor Serrano) – trainer of rival equine Sham – try to out-snark each other. As in real life, Secretariat only truly soars when the action hits the track. Unfortunately, the rest of the film trots when it should gallop.